Home / What is Pinotage? Pinotage is a red wine grape that was bred in South Africa in 1925 and was to become the now world famous signature variety of its homeland. 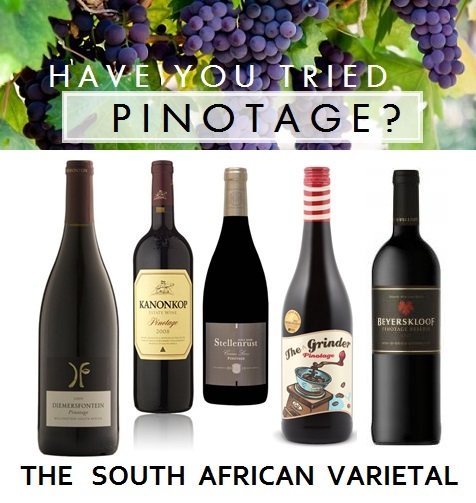 Originally a cross between Pinot Noir and Cinsaut (known as Hermitage at the time), Pinotage naturally produces deep red varietal wines and now has a vast range of blending varieties that has brought the taste of South Africa right around the world. The incredible series of coincidences behind the foundation of the Pinotage wine are now well known around the globe. After brushing a male Hermitage (Cinsaut) flower against a pollen donor Pinot Noir in 1925, Abraham Izak Perold created four seeds that he planted in his own garden. The generally accepted theory about this surprisingly mismatched blend of parent grapes is that Perold was trying to create a baby with the best characteristics of mum and dad – the classic Pinot taste of burgundy with the easy-to-grow disease-resistant quality of Cinsaut. After the experiment, Perold seemingly forgot about it and left for university, leaving his garden to overgrow. A young lecturer who knew about the four seedlings happened to cycle past the residence as a clean-up team entered the garden – he was just in time to save the seedlings. These were re-established in the nursery at Elsenburg Agricultural College by Perolds successor, CJ Theron. In 1935 he grafted material from the seedlings on newly established Richter 99 and Richter 57 rootstock at Welgevallen. The farm Myrtle Grove near Sir Lowry’s Pass will go down in history as the place where the first commercial planting of Pinotage was made. The grapes ripened early, high sugar levels were achieved easily and the vines stayed healthy and vigorous. The early wines also showed a deeper, more intense ruby colour than either parent did. The first real recognition came in 1959 when a Bellevue red wine made from Pinotage was designated the champion wine at the Cape Wine Show. Much of the harvest was used to bulk out popular blends, or for cheap jug wines, or was even distilled for brandy. It seemed as if the final nail had been hammered in Pinotage’s coffin during a visit to South Africa by a group of British Wine Masters in 1976. They did not like this new varietal at all. They described the nose as ‘hot and horrible’, and said the wine reminded them of acetone. The flavour didn’t fare much better. ‘Rusty nails’ was one of the more polite phrases used. Many producers then decided Pinotage had no future, and uprooted large areas of well-established Pinotage vines. A few producers kept the faith. They continued to look for ways to improve the quality of the grape. More particularly, they concentrated their efforts in the cellar. The Diner’s Club Winemaker of the Year focuses on a specific varietal or wine category. The 1987 competition was dedicated to Pinotage. The winning wine was made by Beyer’s Truter at Kanonkop. Wine lovers went back to their cellars and opened the old bottles of Pinotage that they had stored right at the back. They were very pleasantly surprised at how well the wine had aged. Pleasant berry, banana and chocolate flavours had developed. Four years later, the same winemaker put South African Pinotage on the world wine map once again. Kanonkop’s Beyers Truter was named International Winemaker of the Year at the 1991 International Wine and Spirit Competition. He was the first South African winemaker ever to win this prestigious competition.Another delegation of British Wine Masters visited the country in the early 90s. This time they sang Pinotage’s praises. No more ‘hot and horrible’, or ‘rusty nails’.